At a very early stage in the development of Radiology as a specialty, it was recognized that radiographs were quite limited in the types of tissue they could differentiate. Air, fat, soft tissue, bone and metal obviously have very different densities and are therefore clearly distinguishable on a radiograph. However, different soft tissue organs, and pathology such as tumours within them, have fairly similar densities. CT does a much better job of allowing us to distinguish pathology from normal soft tissues, but is often quite limited when performed without the use of a contrast agent. The purpose of contrast media is to artificially alter a physical property of a structure or structures, in order to make otherwise-invisible pathology visible, or to increase the conspicuity of otherwise-subtle abnormalities. In radiography, fluoroscopy and CT, this is accomplished by using a medium that increases the density of the organ and/or vessel being imaged; in MRI, contrast works by causing an alteration in the rate at which protons lose the energy they have taken up from the radiofrequency pulse; while in ultrasound, contrast increases the echogenicity of any tissue that it passes through or accumulates in. Barium is an element with a high atomic number (56); the large number of electrons in barium atoms means that it causes significant attenuation of xray beams and can therefore act as a contrast agent. The barium sulfate solution we use for barium swallows at SVUH. Barium sulphate, a thick liquid, is used as a contrast agent when examining the gastrointestinal tract in our fluoroscopy room. The barium mixture coats the mucosa of the hollow organ (oesophagus, stomach, duodenum, small bowel or colon) being assessed. Pathological processes (e.g. polyps, tumours, ulcers and strictures) are more conspicuous on barium studies if the hollow organ is distended with gas. This is achieved by having the patient swallow CO2-producing granules for upper GI studies, and by insufflating the colon with air or CO2 for colonic studies. When this is performed, the study is called a ‘double-contrast’ examination, as both the Barium and gas act as synergistic contrast agents. Barium is used in much smaller volumes in our department nowadays when compared to even a few years ago, as endoscopic assessment of the oesophagus, stomach and duodenum has become much more widely used, while CT colonography has superseded barium enema for the diagnosis of colonic polyps and carcinomas. Barium is only suitable for enteral use; intravenous injection is generally fatal and is therefore frowned upon. Barium is not safe to use as a contrast agent if there is any concern regarding the possibility of perforation of the oesophagus, stomach or bowel. Leakage of barium from the oesophagus causes a chemical mediastinitis that can be fatal. If barium leaks into the peritoneal cavity, it can cause peritonitis. Again, this is often fatal. You get the general idea here – barium is an excellent contrast medium but you have to be extremely careful where you put it. When a contrast study of a hollow organ that may potentially have perforated is required, a water-soluble iodinated contrast medium is the only safe option (see below). Iodine has a similar atomic number to barium (53), and therefore will attenuate an xray beam when placed in its path. Unlike barium, it is very (but not completely) safe when injected intravascularly. Intravenous iodinated contrast is routinely used in CT. For most abdominal CTs, we also ask the patient to slowly drink a very dilute oral solution of iodinated contrast over an hour or so, in order to opacify the small bowel. We also use iodinated contrast in many fluoroscopy and most IR procedures. 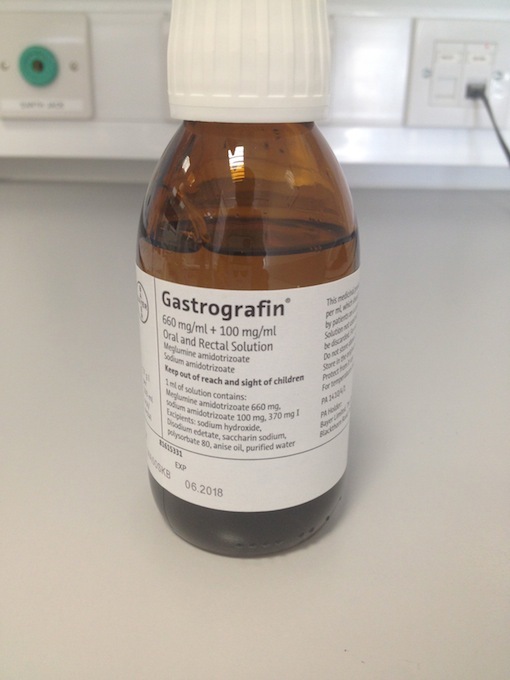 It can be used as a safe alternative to barium when evaluating the oesophagus or bowel of patients in whom there is a suspected perforation; an agent called Gastrografin is often used for this purpose (‘gastrografin swallow’). When performing fluoroscopy-guided joint injections, we use iodinated contrast to confirm that our needle is in the correct position in the joint. In Interventional Radiology, it is routinely injected in almost every procedure, for example it is injected to assess the position of the initial access needle or the catheter being used for the procedure; it’s injected into blood vessels to assess for stenosis, occlusion or haemorrhage; and it’s injected into the biliary tree and renal collecting system/ureter to assess for obstruction. Iodinated contrast media are generally very safe, however there are some potential adverse effects which every medical student should be aware of. Allergic reactions are not uncommon but are usually mild and self-limiting; patients may develop some hives, itching, nausea and/or vomiting. Rarely, patients may develop a severe and life-threatening anaphylactic reaction, resulting in bronchospasm, laryngeal oedema, pulmonary oedema, cardiac arrhythmias and, in very rare cases, death. Radiograph performed following extravasation of a large volume of contrast during a CT examination. Another potential downside of iodinated contrast is its detrimental effect on the kidneys: this nephrotoxicity (‘contrast-induced nephropathy’) can cause a permanent deterioration in renal function and, in severe cases, leave a patient dialysis-dependent. The main risk factors for this are pre-existing renal impairment, diabetes and dehydration. For this reason, we routinely check the renal function of patients attending for an examination that will require iodinated contrast. In some patients, despite every attempt to optimize their renal function in advance of the CT, it will simply not be safe to inject contrast and in these cases the CT is either cancelled or a non-contrast study is performed. Intravenous contrast is usually injected with an automated pump. Should the vein being injected rupture, which is not uncommon, the contrast can extravasate into the soft tissues. 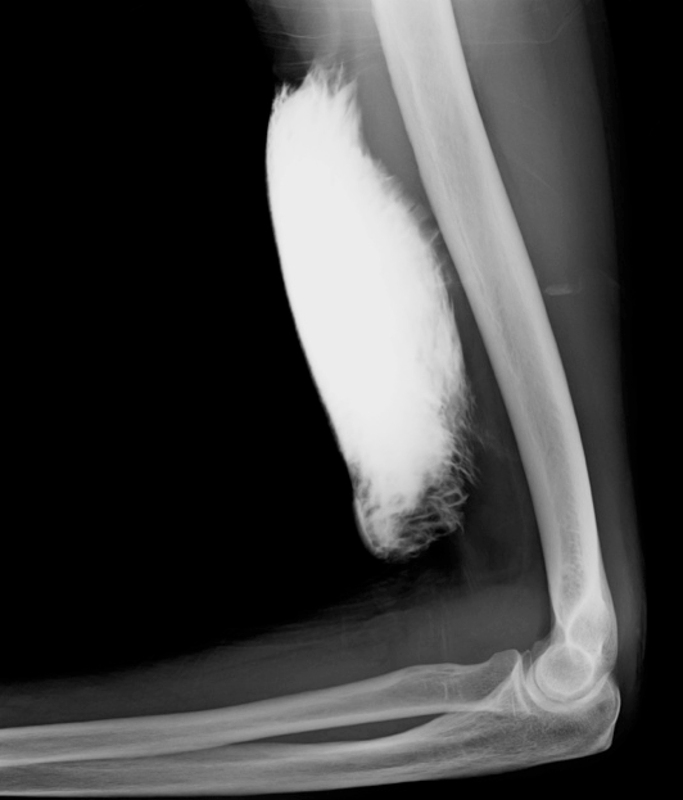 Usually this causes pain and swelling only, however if a large volume extravasates (we typically inject between 100-150 mls for a CT), it can cause compartment syndrome or overlying skin necrosis. 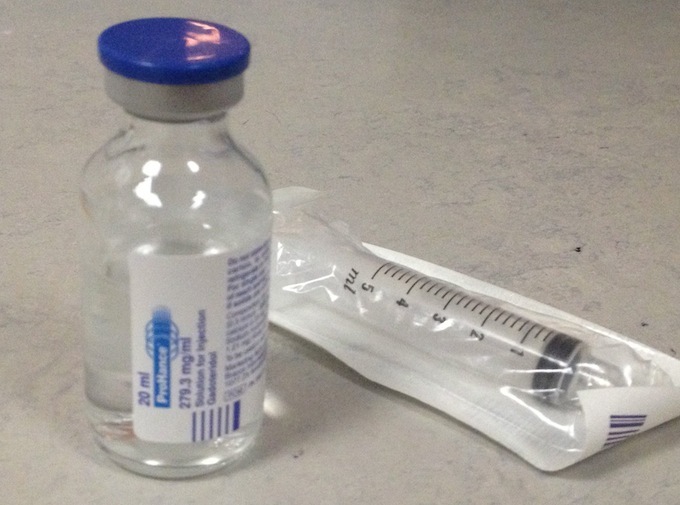 A vial of gadolinium; note that it contains only 20 ml – unlike CT, MR examinations require only a very small volume of contrast to be injected, usually only 10 ml. Gadolinium’s atomic number is 64, very similar to that of barium and iodine, however it works as a contrast medium in a very different manner. Gadolinium ions are ‘paramagnetic’, which means they have unpaired electrons spinning around their nuclei, which in turn means that they behave differently in a magnetic field. You will (perhaps) remember that protons (hydrogen nuclei) take up energy from the radiofrequency pulse transmitted into the body during MRI, and then release that energy as a faint radiofrequency ‘echo’. Wherever it accumulates in the body after injection, gadolinium alters the rate at which the protons in its vicinity release the energy they have taken up. In short, the effect of this is that wherever it accumulates, it causes that part of the MR image to become brighter on T1-weighted images. For this reason, post-contrast MR sequences are always T1-weighted sequences (which can include fat-saturated T1-weighted images, making contrast enhancement even more conspicuous). It is worth noting that, unlike barium and iodine, with gadolinium we are not actually ‘seeing’ the contrast medium on MR imaging, we are seeing its effect on the surrounding protons. The intrinsic soft tissue contrast of MRI is much greater than that of CT, therefore the majority (70-80%) of MR examinations are performed without the use of a contrast agent – it may surprise you, but even MR angiography can be performed without a contrast injection. However, there are many disease processes which are far better assessed on MRI following the injection of gadolinium. For example, when performing MR brain examinations, we routinely do post-contrast imaging when evaluating a primary brain tumour, when looking for metastatic disease, when there’s a clinical concern regarding encephalitis or a cerebral abscess, or when we want to see how active a patient’s multiple sclerosis is. When evaluating liver lesions, post-contrast MR sequences performed at different time intervals after the injection will usually allow us to work out exactly what the lesion is, without having to biopsy it. Overall, gadolinium is much safer than iodinated contrast media. Anaphylactic reactions, although they can occur, are very uncommon. A rare but important potential complication of gadolinium injection is a condition called Nephrogenic Systemic Fibrosis (NSF). Patients with NSF present with limb oedema and cutaneous plaques, deep to which there is subcutaneous fat fibrosis. Muscle fibrosis can also occur and can result in contractures. There is currently no effective treatment for this condition, however with greater awareness of the condition and appropriate precautions, the incidence of NSF is falling. The exact cause of NSF is unclear however the common factor in all patients who develop it is renal impairment, either chronic renal failure or acute kidney injury. For this reason, we routinely check the estimated glomerular filtration rate in patients undergoing a contrast-enhanced MRI; if the eGFR is less than 30 ml/min/1.73m2, we do not administer gadolinium. Intravenous gadolinium has been proven to be teratogenic in animal studies, therefore its use is generally contra-indicated in pregnancy. This is a relatively new development, and involves the intravenous injection of gas-filled microbubbles. The microbubbles are highly echogenic, and therefore when they arrive in an area that is being evaluated with an ultrasound probe, they cause this area to appear much brighter on the image. The main use of IV contrast in ultrasound is in the characterization of liver and renal tumours. The lesion in question is identified with the ultrasound probe, and is then observed for a period of time after the microbubbles are injected. For example, in hepatocellular carcinomas, which take most of their blood supply from the hepatic artery while the normal liver parenchyma gets most of its supply from the portal vein, the lesion rapidly becomes hyperechoic and then becomes hypoechoic relative to normal liver. In contrast, liver haemangiomas slowly become hyperechoic and remain so long after the microbubbles have left the normal liver parenchyma. 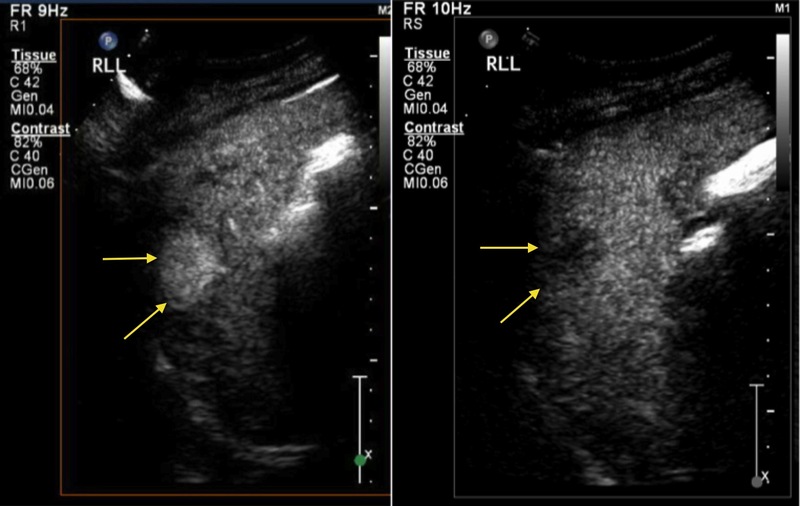 Examples of contrast-enhanced ultrasound (CEUS) studies are shown below. 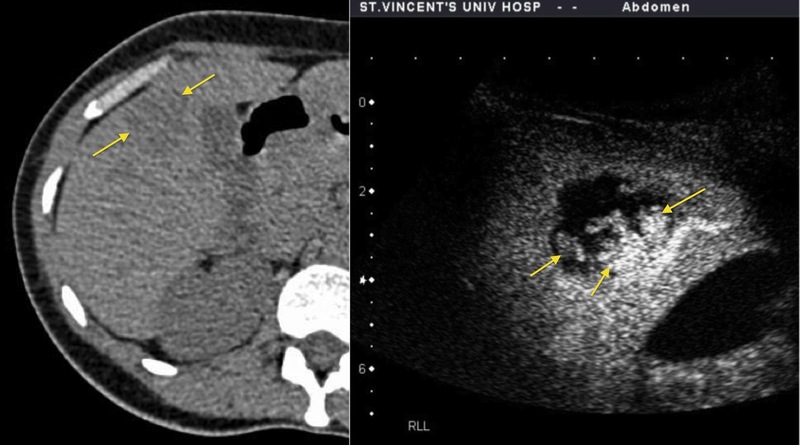 This patient with alcoholic liver disease had a routine ultrasound of liver showing a new hypoechoic lesion in the right lobe. CEUS was performed. The lesion demonstrated hyperenhancement, showing rapid uptake of the injected microbubbles resulting in the mass becoming hyperechoic (left-hand image). Subsequently, the lesion ‘washes out’, becoming hypechoic relative to the remainder of the liver parenchyma (right image). These enhancement characteristics are typical of hepatocellular carcinoma. This young woman presented with renal colic and underwent a CT KUB, which showed an incidental lesion in the liver (arrows). CEUS was performed and showed nodular enhancement (arrows) at the periphery of the mass, characteristic of a haemangioma.